A free place that gives clothing, diapers, blankets, etc. to families that need! Come join us on the second Thursday of each month from 11am-4pm or the fourth Tuesday of the month from 4-7pm at the Port Orchard SDA Fireside room. 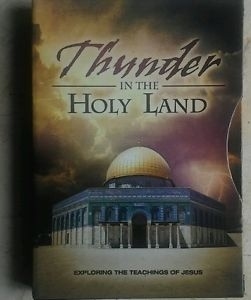 Thunder in the Holy Land Group. Travel through Scripture and history on a transforming journey with Jesus. This fascinating DVD series filmed in the Middle East begins the week of Sept 25 in a home near you. Blessing Bags are bags of travel-sized items that are hard for the homeless to come by. We all know that giving money is NOT a good idea and ignoring it is not going to help so we are putting together these bags of to help ease the pain of being homeless. Completed bags can be picked up in the sanctuary for you to keep in your car so you're prepared the next time you see someone on the street that needs a hand. Save your Campbell soup labels with the education coupon on it and vegetarian food labels for our school and missions. Remember to have UPC bar code on the label. Coupons can be dropped in the Label Box in the Library.